Once my child outgrew the need for a stroller, I found it hard to carry all the stuff we’d need for a day long outing without the stroller to hold all the junk! Has that happened to you yet? I love to carry my DSLR on our outings, but I also need snacks and waters for us, jackets, extra clothing in case of accidents, etc. I started searching for a backpack that would hold both my camera and the gear we need for a day long outing. I needed half camera bag, half purse/diaper bag. 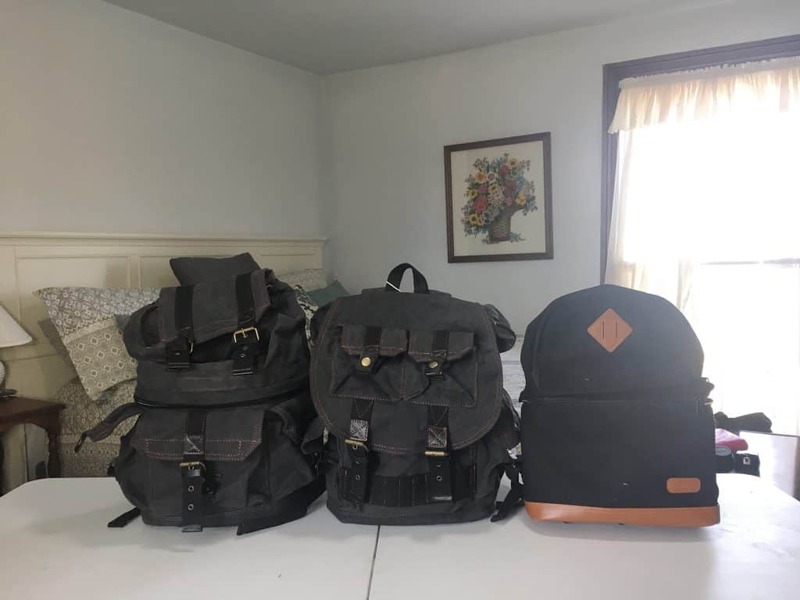 I finally found three camera backpacks – the Kattee Rucksack, the Kattee Canvas Backpack, and the Kattee Military Style Backpack. They all have a separate camera compartment in the bottom of the backpack and a compartment in the top for all the other essentials. The next problem was choosing one! I ended up ordering all three backpacks. Today I’m sharing my thoughts and a video review comparing the three backpacks. *Note- I found the names Rucksack and Military Style interchangeable when buying these backpacks. For the purpose of this video review I’m calling the 1st backpack that has 3 outer pockets the Rucksack and the 2nd (middle) backpack that has 5 outer pockets the Military Style. You might find the names of the backpacks different when buying, just pay attention to how many outer pockets it has to be sure you are purchasing the right one. If you are frequently carrying a laptop 13 inches or bigger this is the best choice. If you’ll be carrying a heavy load in the top compartment, I think this permanent space divider is the most sturdy option. I loved this one for a camera bag that is also a purse. However, for day trips with my children in tow it will be much too small. For an adventurous Mom’s day out this would be a wonderful choice. Which one of these three backpacks suit you best? If you have other recommendations for camera backpacks that are partially padded camera compartment and partially open for day trip essentials I’d love to hear them!